This pretty little project will light up your life (literally!). When the bumblebee lands on the flower, an LED lights up in the center of the flower. Attached to a pin or hair clip, this flower would be a one-of-a-kind statement piece. A great introduction to soft circuitry, project is a fun combination of knitting and a simple electronic circuit. The flower is knit in several small pieces, then assembled around a base of plastic canvas, giving the flower shape and strength. Conductive thread, a nickel-sized battery and a tiny LED (available through Sparkfun and other online retailers) make up a simple circuit. Two little neodymium magnets (available at most well-stocked craft stores) hold the bumblebee in place on the petal, completing the circuit. The pattern is available here for free! 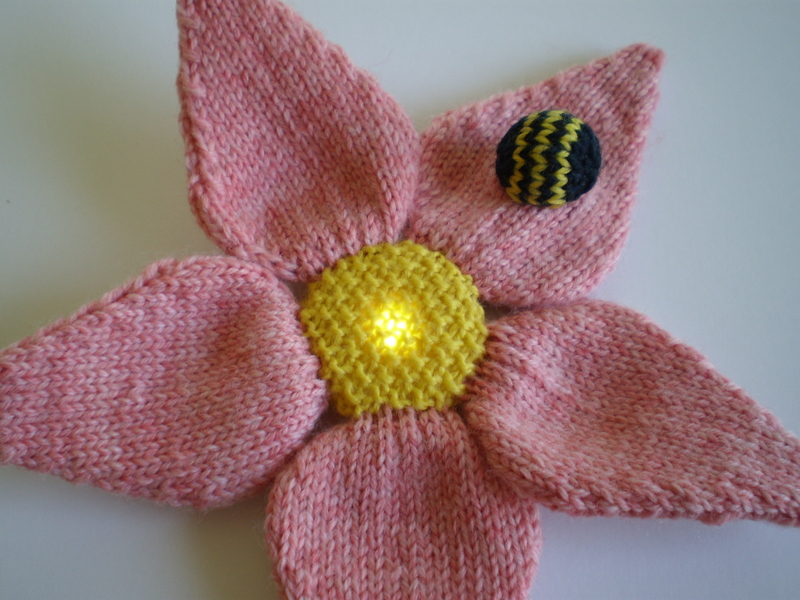 This entry was posted in Patterns and tagged bee, e-textile, electric, electric circuit, flower, led, light, light-up, soft circuit on May 19, 2014 by onemilljellybeans.